Reliable and easy to use, the 5 panel kit test thresholds are equivalent to standard drug screening in the United States and will provide results similar to what would be obtained during a random drug screen. 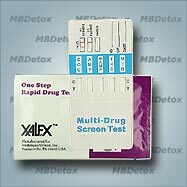 The 5 panel home test kit provides instant results for all 5 drugs of abuse as listed by the Substance Abuse and Mental Health Services Administration (SAMHSA). Reliable and easy to use, the 5 panel kit test thresholds are equivalent to standard drug screening in the United States and will provide results similar to what would be obtained during a random drug screen. Use the provided dropper to place 6 to 8 drops of urine into the sample well. Do not add more than 8 drops. Two pink color bands appear. One band appears in the Control Zone ("C") and one in the Test Zone ("T"). A negative result indicates that drug levels are below the cutoff level.